Unfriendly Competition giveaway! :) Come win! Sooo sorry!! I had the comments off! Enter away! Rumor has it that copies of UNFRIENDLY COMPETITION are in! I haven't seen them yet, but I will next week! Eeeee! Anyone interested in a signed copy? How about *two* of you? To enter, leave a comment here, on my LiveJournal or in both places. You have until Monday, January 2nd at 11:59 EST to enter. I only ship to US addresses. You must leave me a way to contact you and you'll get your prize 2-3 weeks after we get in touch, but likely sooner. You'll get an extra entry in the contest, btw, if you blog about it, post a note on your Facebook, Tweet about the contest, etc. Just leave me a link in your comment. Can't wait for Unfriendly Competition! I would love to be entered. I can't wait for Unfriendly Competition! =) You're doing such a good job on this series! I can't wait to get UC! I waited for Canterwood Crest Unfriendly Competition for sooooooo long!!! Once I read four books on the same day! I'm Team Jacob, though. I'll be saaaaad when Canterwood Crest ends... Thank you Jess for writing the best books ever!!! If you see on my Goodread's account you're number one on my fave author's list! I would love to enter!! My birthday is that month, Jan., so if i win it would be a *great* early birthday present!! I love the series, and this cover is great! All the best, and Merry Christmas/ Early Happy New Year!! Hi, I posted at Live Journal, and I'm just making sure my entry is in. Love the pretty "Chosen" cover! I love Canterwood and can't wait for Unfriendly Competition! This is the best book series I have read. Thanks so much for writing these books, you are such a great author! I want a signed copy sooooo bad!! !My e-mail is jockeyalicia@yahoo.com if you want to contact me. Thanks!! AWESOME, i cant wait for UC, i loved SRL(even though it was on the bit of short side). I love the new chosen cover :). I cant wait for it to come out and i'd love to be entered. can't wait until I read Unfriendly Competition!! I'm so excited for Unfriendly Competition! Love CC!!! My email is spider72hr@gmail.com and I am also putting this on Gmail as my status thingy. It would make my YEAR if I won!! 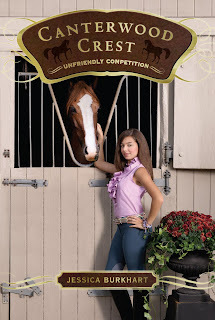 Yay for the release of Unfriendly Competition!! I would love to be in the contest! I love the Canterwood Crest Series-and have a countdown to the new book everywhere. I drive my family insane talking about the books! I can't wait till it comes out! hey my name is grace and i LOVE <33333 CCA!! i would LOVEE to win a book!!!!! thanx! my email is: zukowskigrace@yahoo.com and i'm friends with you on facebook! Hey can't wait!! I haven't even read the last one yet. :( been to busy to order one. It would be awesome to win this!! yay! i am a canterwood junkie:) sign me up! go canterwood! SK0000 is my user, so check it out! Could you please enter me in your Unfriendly Competition giveaway???? I would love love LOVE to win the book!!!! This is by far my favorite series! I NEED to find out what happens next after the chapter you posted and who the blogger is!!!! Plus I love the new cover for Chosen! It is indeed shinny!!!! P.S. SORRY FOR THE CAPS! I JUST GOT SOO EXCITED WHEN I SAW THIS POST!!! Unfriendly Competition in less than a month!